JAMIE CHUNG: Big Hero 6 follows the story of a group of friends who join together to solve a huge mystery. At the heart of the story is a big, white, inflatable medical robot named Baymax and a kid called Hiro. Baymax is the most loveable robot you’ll ever meet! JAMIE CHUNG: The purse is amazing! It reminds me of Penny’s book from Inspector Gadget. How many recording sessions did you have for the movie? JAMIE CHUNG: I worked on the movie for about a year and I used to do one or two sessions every month. The longest session was six hours long, but most of them are much shorter than that. I’m sure it’s different for Scott Adsit and Ryan Potter, who play Baymax and Hiro. They had a lot more lines than us. JAMIE CHUNG: Who is my biggest hero? This sounds so cliché, but it’s definitely my mom – especially in terms of sacrifices and selflessness. JAMIE CHUNG: For the sake of the drought in California, I would love the power to control the weather. I would make it rain a lot. We’d sort out the drought in no time. Why should we watch Big Hero 6? 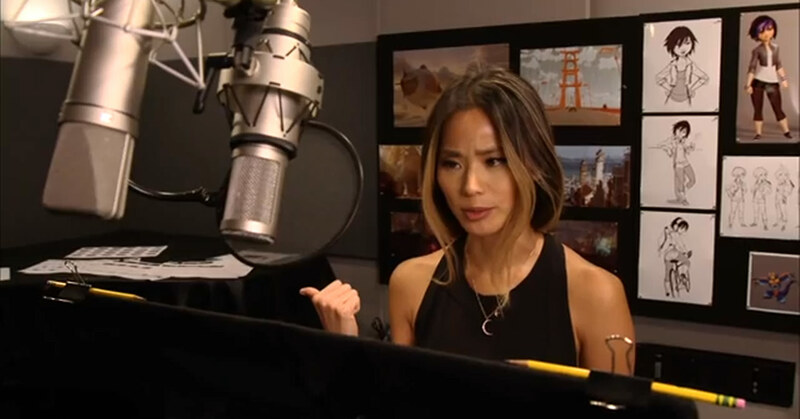 JAMIE CHUNG: Big Hero 6 is a story about family and it’s a story about friendship – but the movie is action packed and it’s got a lot of heart, so there’s something for everyone. It’s hilarious, too. It’s awesome!